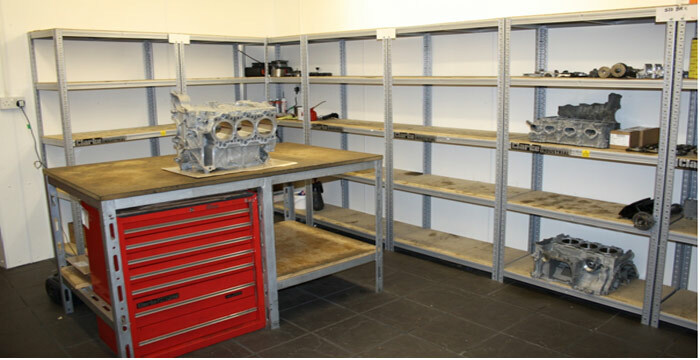 In addition to our 9 ramp workshop we have a dedicated engine strip down & cleaning/preparation room, a fully equipped machine shop housing 4 mills (including 3 axis CNC), 2 lathes, diamond skimmer, diamond multi-axis honing machine, 2 engine assembly "clean" rooms, rolling road & engine dynamometer and a purpose built storage racking facility for the numerous components removed during the process. The dedicated engine team, comprising of a full time precision machinist and 3 re-builders (with over 40 years combined engine re-manufacture experience including Porsche GB engine training), is headed up by Hartech's Technical Director Barry Hart who's long engineering career includes design & manufacture of racing motorcycle & car components for Armstrong (of which he was technical director of engine development), Ducati, Kawasaki, Suzuki & Lotus Formula 1 as well as composite development in the aerospace industry and further afield. Barry is also on the steering committee for the "Centre For Advanced Performance Engineering" of The University Of Bolton, a new £5 million motor sport facility.